Political opportunism is like the colour of the sky: it changes according to the time of the day, the season and other factors. On Friday, 27 November, Prime Minister Narendra Modi was in an unusual avatar: he praised BR Ambedkar, quoting him on he and his ideology reflected. He was speaking in Parliament, at the two-day special sitting that started 26 November, designated by the Modi government as Constitution Day. The session to discuss commitment to the Constitution was part of the 125th birth anniversary celebrations of Ambedkar. There are opposing interpretations of what Modi and others in his government said at the session. Some think it is an inclusive gesture and should be taken positively. Others disagree. Opposition leaders see a conspiracy in the softness, in the pro-Ambedkar attitude of the government. 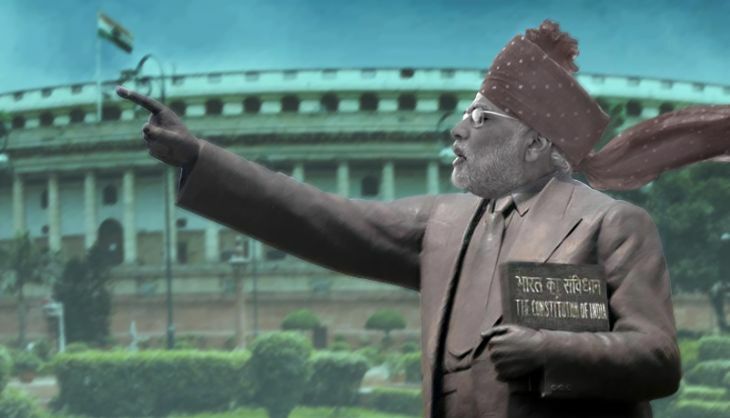 They see an attempt by the Bharatiya Janata Party to give itself a role in the movement for independence; an attempt to claim Ambedkar and his legacy and to provoke arguments around key elements of the Constitution, igniting a public debate, pushing for amendments, changes. 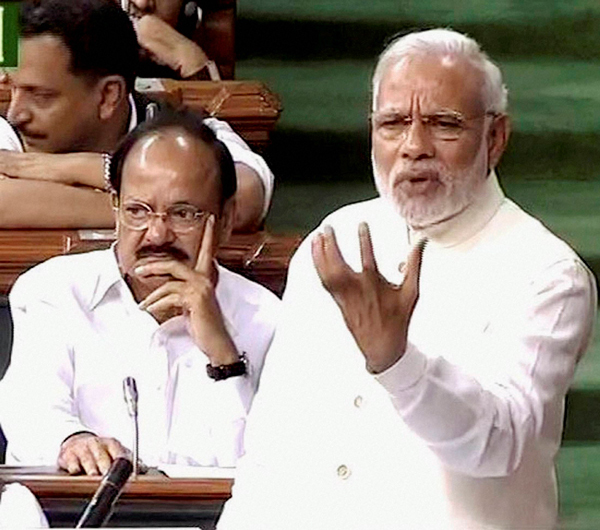 Modi on Friday was soft and humble in the House. Unlike the Modi that Parliament and people have seen since May 2014. He was trying to be more friendly with the Opposition, which has hardly let Parliament function in the Monsoon session. Most Bills proposed by the government are pending. Especially, the Rajya Sabha has repeatedly snubbed the arrogance and exclusiveness of the Treasury Benches, who is in a minority there. But Modi had a more pressing need: to claim Ambedkar. He painted his speech with colours that would assimilate in the portrait of the leader who visioned the Constitution. The PM talked about diversity and its beauty, saying one can't ignore the role of the leaders who contributed to the making of the Constitution. "Mujhe kshama karein, mein kisi ki alochana nahi kar raha. Lekin agar Babasaheb nahi hote, to Samvidhan ek mahaan samajik dastavej banne se chook jata. Yeh unka dard, unki peeda thi jiski wajah se yeh samvidhan bana," Modi said. Modi praised Ambedkar - the "dalit maa ka beta" (the son of a Dalit mother) - and quoted a Sanskrit shloka to describe him. There was no response when he read it; the hindi translation earned some claps. "If someone even thinks about changing the constitution, he is actually attempting suicide," he said. "A majority doesn't mean anything could be imposed on people." And Modi brought in references: From Vajpayee to his own speeches to social reformers such as Raja Ram Mohan Roy, Ishwarchandra Bidyasagar (calling him Vidyasagar Rao) and others. The efforts were to showcase a more inclusive, tolerant and liberal PM. To claim Ambedkar and be in his shoes. "In 2009, we celebrated 60 years of Constitution in Gujarat. We placed a big copy of the Constitution on an elephant," Modi said. This is not the first time Modi and the school of thought he follows has tried to bag Ambedkar. There have been several attempts. Rashtriya Swayamsevak Sangh (RSS) has claimed several times that Ambedkar was happy with the organisation's work. Ambedkar, in fact, fought his entire life against the core merits of Hinduism. In the end he accepted Buddhism along with his supporters. The mantra of Madhukar 'Balasaheb' Deoras was social engineering, focused on looping in more and more people. This was not possible without bringing in the majority castes, which are Dalits and backwards. This is the reason why Vallabhbhai Patel, who banned the RSS after Gandhi's assassination, is now part of the RSS-BJP pantheon. The Sangh Parivar now uses Patel on its prime posters to gain wider acceptability. Not to forget, the giant statue of his that Modi has promised. Of late, RSS chief Mohan Bhagwat has released several books where writers from the Sangh stable have tried to re-write the Ambedkar story in a light favouring their ideology. Expect more books on Ambedkar and Gandhi, sources in the organisation said. Such efforts have been accelerated in the Modi regime. From Uttar Pradesh to Punjab and in many other states, Ambedkar could give the BJP passage to Dalit votes. "It is an attempt (NDA's) to worm into the national movement where you have no role," said Sitaram Yechury, who represents Communist Party of India (Marxist) in the Upper House. He and the leader of Opposition Ghulam Nabi Azad told the House that the notification for the celebration was issued by the Ministry for Social Justice on 19 November. "This is technically not possible as it has to be done by the Home Ministry," said Azad. They also produced orders issued by the education ministry on 10 November - a full nine days before the notification was issued - regarding the celebration. "How come the orders came before the notification. This is illegal and wrong way of doing things," the Congress leader added. Both Yechury and Azad pointed out that Ambedkar himself had said the Constitution would be fully adopted on 26 January. That's the day India celebrates Republic Day. Then why does the BJP wants to rewrite history. "It is an event. You know event management and through it you want to claim the space in the history where you didn't contribute," Yechury said. The Opposition has reasons to doubt Modi and his government. The opening speeches by Rajnath Singh in Lok Sabha and Arun Jaitley in Rajya Sabha focused on the larger agenda of claiming Ambedkar and at the same time, provoking a debate around the main elements of the Constitution. Ambedkar had not put the word 'secularism' in Constitution and now it is the most misused word in India, Singh said. Jaitley talked about clauses about equality and uniformity, elaborating how the period of Emergency was biggest setback to the Constitution. Yechury called it a pick-and-choose tactic, accusing the government for playing with clauses of its choice according to convenience. Azad called it divide-and-rule while Janata Dal (United)'s Sharad Yadav said the country still awaits implementation of social justice and dignity to the poor and marginalised, who form the majority. open a passage to debate and amend/change the Constitution. The PM ended his speech by slogans: "The government has only one religion - India First. The government has only one holy book - the Constitution" and so on. The problem with his speech and his 'idea of India' is rooted in his personality, his party and its ideology. Architects of communal violence have found place in his government. He has preferred criminals and the corrupt over clean and committed people. The PM is hardly democratic and not at all inclusive in his style of governance. The hate speeches in the Bihar election campaign and incidents such as the ones in Dadri and Faridabad are completely opposite to what Modi said in the House on Friday. Ambedkar's idea about economic policies, foreign policy, federalism, home affairs and the commitment to social inclusiveness are elements missing from Modi's actions. The way the minorities, the marginalised, academicians and the people of arts, literature and sciences are suffering in this regime is completely against Ambedkar's vision and idea. 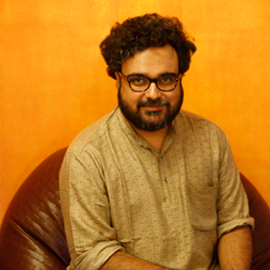 The problem of Modi is that he can't control the core organisations of the ideology. The pledge for Ram Mandir and commitment to the Constitution is like mixing oil with water. It can't work. That's the fabric of the country and Modi can't change it. A senior parliamentarian warned: "Don't get confused with the makeup. It won't last."